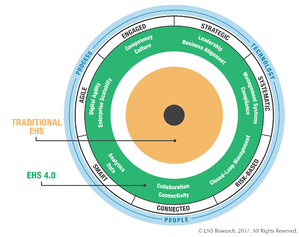 Environment, health and safety (EHS) 4.0 digital transformation initiative isn’t an all or nothing proposition.Organizations need to assess their current foundation of people, processes and technology capabilities to determine the Digital Transformation readiness of their EHS business function. Each organization will have a unique starting point. For some organizations, it may be appropriate to shore up foundational EHS, safety, risk management system(s) before or in parallel with undertaking digitalization initiatives. There is no one-size-fits-all approach. The potential benefits of digitalization are compelling. Digital technologies such as the Industrial Internet of Things (IIoT), Big Data, and advanced analytics can enable step-change improvement not only by process optimization but moving towards predictive risk management. So how can EHS business leaders proceed? Here are five best practices to help plan an EHS 4.0 digital initiative and maximize the odds of its success. 1. Make business outcomes the priority. EHS 4.0 digital transformation is not all about tinkering with and implementing cool technology. It’s about how technology can improve collaboration, optimize processes, and produce results. Our Industrial Transformation research shows that companies that make business outcomes the priority rather than technology evaluation are much more likely to achieve success with transformation projects. So, avoid shiny object syndrome and focus on business results. Our digital readiness research shows that Industrial Transformation success is strongly associated with inclusiveness throughout the transformation process. This means casting a wide net to engage more stakeholders across the value chain and throughout all levels of the organization from early planning to execution. Our data also shows that a combined top-down and bottom-up approach converging corporate/business unit teams and plant teams is a harbinger for success. 3. Treat stakeholders like customers. The mission of the EHS business function is (or should be) to support the strategic business objectives of the enterprise. EHS 4.0 transformation should focus on optimizing core value chain operations by serving, and delivering value to, internal customers. This goes far beyond enabling EHS professionals to do their jobs more effectively and efficiently. The initiative should partner with operations teams and other business functions (such as R&D, procurement, engineering, maintenance, quality, supply chain, etc.) to improve their “customer experience” by empowering them with timely information and improved tools to do their jobs better. 4. Think systems, avoid silos. A cross-functional end-to-end process approach is inherent in digitalization. EHS management systems should by definition embed and integrate a wide range of capabilities and processes to achieve performance objectives and drive improvement. Achieving this with siloed organizations, fragmented technology systems, disconnected processes, and disparate data will be difficult if not impossible. EHS 4.0 digitalization supports a true inter-connected systems approach across people, process, and technology. 5. Invest in change management. Although the application of digital technology is foundational to EHS 4.0 transformation, this is not merely an IT project. It’s a business transformation initiative. Success will depend on how the initiative works with and supports organizational culture. This requires an investment in organizational change management from the start and throughout the entire journey. The strategic Digital Transformation of industrial operations is happening now. This puts EHS leaders at a “digital crossroads” of opportunity and risk. Digital technologies offer the realistic promise of step-change EHS performance improvement enabled by IIoT, Big Data, predictive analytics, augmented reality, mobile, Cloud and many other digital innovations. This is a once-in-a career opportunity to redefine how the EHS business function will participate in and add value to the business. Given the pace of change, the best time to have developed a game plan for how EHS will participate in your organization’s digitalization initiatives was yesterday. The second-best time is today. We advise EHS leaders to join forces with their company’s digital initiatives to ride the momentum and advance. The path forward may not be clear or easy, but the rewards promise to be significant.